Last year I didn't make as much use out of the freebies I made as I wish I had. This year I am planning to make items to use in my albums and I'll be putting some of those up here as freebies. This week, I made a set of simple bordered journalers that match the colors of my 2013 album. Yes, that means a couple of these journalers coordinate well with the Seafoam Project Life kit. Others match colors in the My Mind's Eye Dolled Up paper stack. 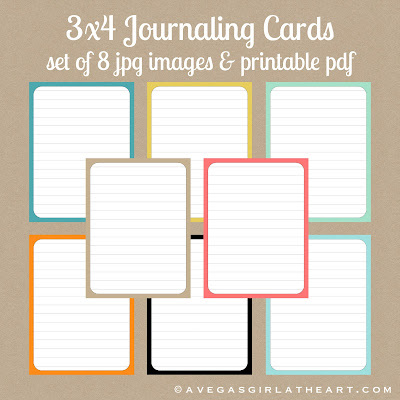 There are 8 cards if you want to use them digitally (JPG format) and a printable PDF if you just want to print them. Click here to grab your freebie. perfect - just what I needed! Thank you, you are the best! Thanks for these and all your freebies! You're awesome! Love the colors! And I just bought a corner rounder. Thank you so much, you are so generous. Thank you for sharing your awesome freebies!! I love them! Thank you for the journaling card freebies. I especially LOVE that you kept the outline color to the very edges so we could choose to corner round or not. I use several different corner rounders and each brand has a slightly different arc around the edge so with your full color edge, it doesn't matter which one corner rounder I pick up - it will corner round full color as well. BONUS thinking, thank you, thank you!!! Thank you! I clicked to your site from http://misskim.typepad.com and I'm so happy I clicked! I spent forever searching google for some digital journaling cards to supplement my official PL kit. Your site is awesome, your work is awesome, and I love your style. Thank you! Great colors can be used everywhere. Just found you on Pinterest and am loving your work! Thanks so much! Merci merci beaucoup ! c'est juste parfait. Bravo. I LOVE these cards, thanks loads. Thought you might like to see one of them in action on my PL page. Thank you so much for this wonderful addition to the stash of goodies I am putting together for my daughter. I have made the basic SmashBook for her to document my grandson 2nd year...she had a calendar I made for her to do the same for his 1st year. Thanks so much again!! !